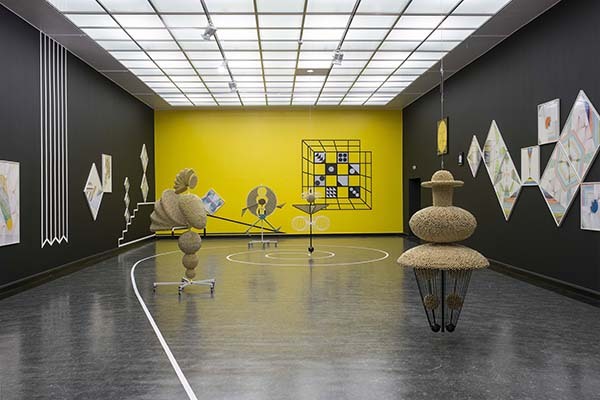 For Haegue Yang’s first solo exhibition in the Nordic region she presents a series of new works conceived especially for Bergen Kunsthall. Yang’s works are internationally appreciated, and known for their eloquent and seductive language of visual abstraction that is often combined with sensory experiences. Lesser known is her ongoing research, which is empowered by close readings of connecting biographical narratives of historical figures, and builds on underlying references to cultural, social and political history. Continuing her dialogue with the canon of modernist art, this time Yang explores her interest in the figurative and spatial elements of the Bauhaus master Oskar Schlemmer’s Triadic Ballet from 1922. 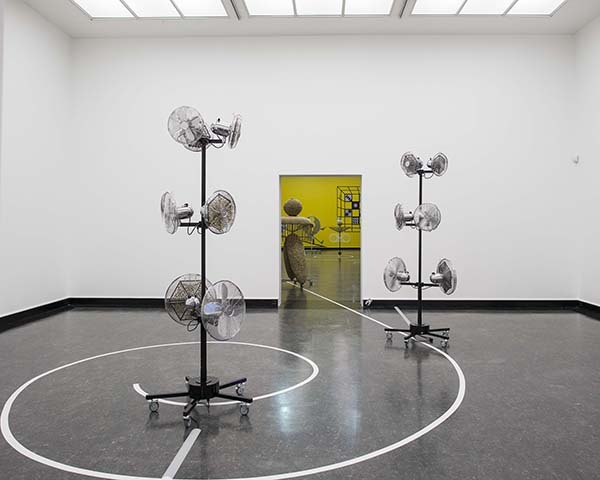 To do this Yang has transformed the exhibition space into an experimental stage where sculptures and wall pieces form both scenic elements and active protagonists. This expansive installation consists of a series of new sculptures on casters or on steel wire, wall paintings and new collages in the Trustworthies series. These collages make use of used envelopes and sandpaper composed into a geometry of patterns and compositions that build a simultaneous staging of figures and spaces. Yang occupies the exhibition space with sophisticated sensory experiences that include scent, sound, light and tactility. The Sonic Rotating Lines envelop the exhibition with sound, creating a specific atmosphere that is visual, spatial and aural. These ‘straight lines’ and ‘broken lines’ are wall-mounted objects that are covered with small nickel bells, and can be propelled into rotation by hand, which transforms the ‘lines’ into ‘circles’, disintegrating the rigorous physical geometry into another illusory geometry of circles. The act of spinning also causes the bells to tinkle, filling the surrounding space with a rhythm of sound, which corresponds to the speed of rotation. 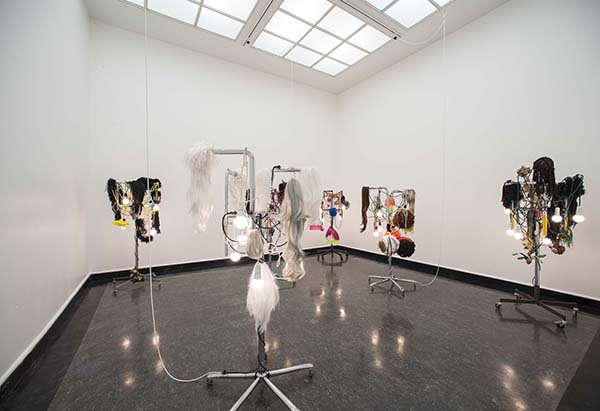 Bells have been a recurring element in a number of Yang’s works over the past few years; only very recently have they been used as a principal material in several new sculptures, including Sonicwears (2013) and Sonic Dances (2013). Mobility and motion have been another focus for Yang over the past few years. Mobility is associated here, not only in purely physical or formal terms (with mechanical devices and kinetic constructions), but also in political and historical terms. Mobility and motion correspond to major concerns to which Yang constantly returns: migration, postcolonial diasporas, enforced exile, social mobility or what one could perhaps call ‘lifetime mobility’. With her mobile performative sculptures Yang negates the static furnishings of the exhibition space with its fixed installations and carefully placed objects. By allowing the sculptures to move Yang introduces instability and continuous change into an otherwise solid institutional framework. Understood as complex concepts, motion and mobility become a fruitful focus for Yang’s multi-faceted artistic exploration. Yang’s works are grounded in considerable research in political history. Working with this source material, she links various geopolitical contexts and histories in an attempt to understand or comment on our own time. These investigations are often closely connected with personal experiences, but also with the biographies of well known historical figures. Yang studies the stories of these people and uses their work and life stories both as inspiration and as a historical prism. However, in the finished works these underlying investigations are often hidden or disguised – translated into an abstract formal idiom. This translation – from the political and historical into the formal and abstract – constitutes one of the fundamental strategies in Yang’s praxis. She demonstrates an unshakable faith that historical narratives can be made comprehensible through the language of visual art, without being linguistically explanatory in an objective or didactic way. Yang’s works are often informed by this dynamic shift between hiding and displaying, revealing and concealing. This catalogue accompanies two parallel solo exhibitions held in the autumn of 2013 by Haegue Yang: Journal of Bouba/kiki at Glasgow Sculpture Studios, Glasgow, Scotland (5 October – 20 December 2013); and Journal of Echomimetic Motions at Bergen Kunsthall, Bergen, Norway (18 October – 22 December 2013). This new collaborative publication, Dare to Count Phonemes and Graphemes, has evolved within the framework of these geographically separate, yet collaboratively conceived exhibitions. While each exhibition was an independent manifestation, they both are intrinsically linked to Yang’s continuous artistic evolution. 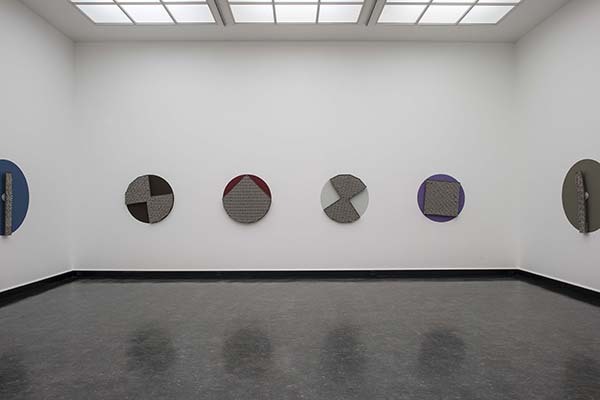 The developments shown are emblematic of the artist’s recent projects, focusing on the ideas of abstraction and motion. This catalogue presents two newly commissioned texts, as well as an interview between Yang and the respective curators of the exhibitions, which explore the artist’s distinctive and diverse work.